Occasionally you strike a book or long article that you really want to pay attention to. 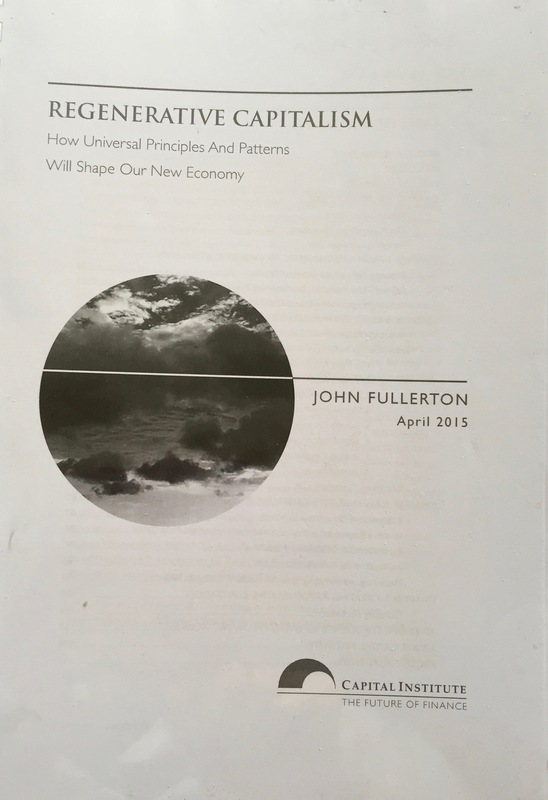 For me I have discovered John Fullerton's white paper called Regenerative Capitalism How Universal Principles and Patterns will Shape our New Economy. It is 120 pages long and very dense, dated April 2015. I found Fullerton through watching a large part of After Fossil Fuels The New Economy, a filmed seminar from Oberlin College, Ohio held in early October. (Try 1 hour 5 mins into this particular section, as it is long) I was excited because here was someone saying what we have been saying. I knew that people rarely are the sole inventors of new ideas. He wrote we need to design an economy according to nature's principles. He knows that creativity and regenerative potential happens at the edges, a teaching from permaculture. He even quotes evolutionary biologist Elisabet Sahtouris. He appeared with Juliet Schorr, a sociologist, former economist, who agreed with him yet reminded him that power and conflict must not be omitted and that one must not be attached too strongly to a metaphor. When I looked at his acknowledgements I got quite excited. Here was a former JP Morgan banker listing Fritjof Capra, Janine Benyus, Hazel Henderson, David Korten, Thomas Berry, Buckminster Fuller, Jane Jacobs, Dana Meadows, EF Schumacher and Gar Alperovitz. Reading the text over the next few days I found he even knew a little of Bernard Lietaer and Elinor Ostrom and his scientific advisor is engineer Sally Goerner a student of flow and energy network sciences. She taught him about the optimum balance between efficiency and resilience. Goerner was a co-author with Bernard Lietaer in their Club of Rome book on Money and Sustainability. Reading Charles Eisenstein's book Sacred Economics was punctuated for me with long pauses while I digested one amazing sentence after another. Fullerton had this same effect on me in that he was articulating ideas only half formed in my mind, and doing so with such eloquent language. Then again, because he is qualified in finance and business, I learnt from his perspective. People who have voluntarily opted out of Wall Street to think and read and explore new ideas are very precious to the new economy movement and Fullerton is one of these. 1. In Right Relationship – realising we are part of an interconnected web of life. 2. Views Wealth Holistically – realising there are multiple forms of capital. 3. Innovative, Adaptive, Responsive. This applies to individuals, businesses, society, governments and is the way for maximum fitness. It means the end of rigid hierarchical systems that control today’s centralised states. 4. Empowered participation. Everyone matters and the health of any human economy is dependent on everyone’s unique contribution to the health of the whole. 5. Honours Community and Place. Diversity and richness are essential to system vitality. Each human community embodies a mosaic of traditions, beliefs and potentialities, each uniquely shaped by long-term pressures of geography, history, culture, environment and changing human needs. 6. Edge Effect Abundance. The most innovation and abundance of life happens at the edges of systems e.g where rivers meet the ocean. 7. Robust Circulatory Flow. "Just as human health depends on robust circulation of oxygen, nutrients etc, so too economic health depends on robust circulatory flows of money, information, waste, resources, goods and services to support exchange, flush toxins, and nourish every participant at every level of our human networks." 8. Seeks Balance. There is a delicate balance between resilience and efficiency. Small, diverse and flexible will lead to stagnation while big, efficient and focused will lead to collapse. There is a window of vitality half way. He doesn't really address tax reform in a big way, or the need to share the rents though he appears to have read Peter Barnes. He approves of progressive taxation, financial transaction tax and wants aggressive inheritance taxes. So there is more thinking to be done there. Like many others he probably conflates land with capital. Yes university teaching has been very successful in getting rid of land as a factor of production. Well done neoclassical economists – your strategy worked brilliantly. I think he would love to read Silvio Gesell's book The Natural Economic Order to learn about the design of naturally circulating money. That would set him thinking. And perhaps some of Lietaer's books, particularly where he describes how Gesell's ideas were put into practice in Dynastic Egypt, Central Middle Ages and in Great Depression towns in Europe. Oh, and how he would love to read Reinventing Organisations by Frederic Laloux!